Great Auto Decor: Add a tropical air to your auto with a doll that’ll sway to the songs on your radio. Fabulous Stocking Stuffer: “Mele Kalikimaka” is Hawaiian for Merry Christmas! Unique Party Favors: Better than bags of candy. Place Card Holders at Anniversary Parties and Weddings: Dolls can hold a card or take a tag and ‘tie one on’. Fun Door Prizes: Who wouldn’t want to take one of these cuties home! Trade Show Giveaways: These are fun, unique giveaways that everyone will love and they can actually use. Each Dashboard Doll will wiggle when shaken and comes with adhesive tape on the base to help keep them in place. Simply remove protective paper off of the adhesive tape and attach to a non-porous surface. You may choose to leave the tape covered and display your Hula Doll on a shelf, desk or tabletop. Or group them with your tiki mugs on a home bar as exotic Hawaiian decor. All of our Hula Dolls move and sway when shaken. Adhesive tape on the base keeps them in place. Display them on a dashboard, desk or shelf. 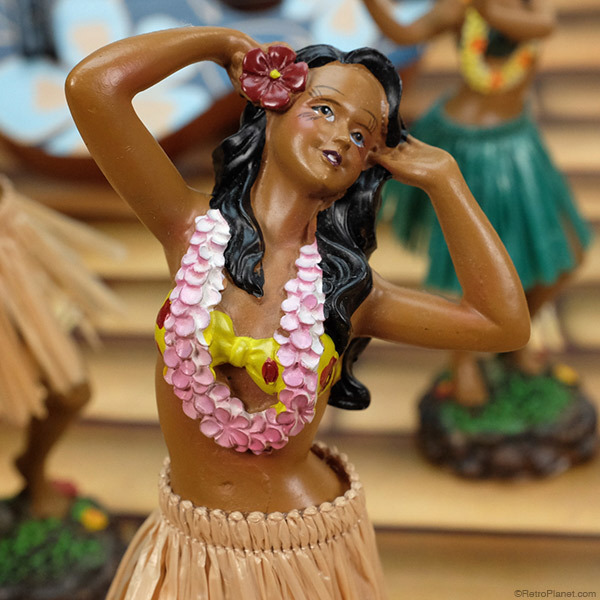 There are many designs and styles of hula dashboard dolls and they make a fun tropically themed collectible. And the more you buy—the better with our Mix & Match Discount. Buy 2 hula dolls and you save 5% off the retail price. Buy 3 or more and you save 10%! 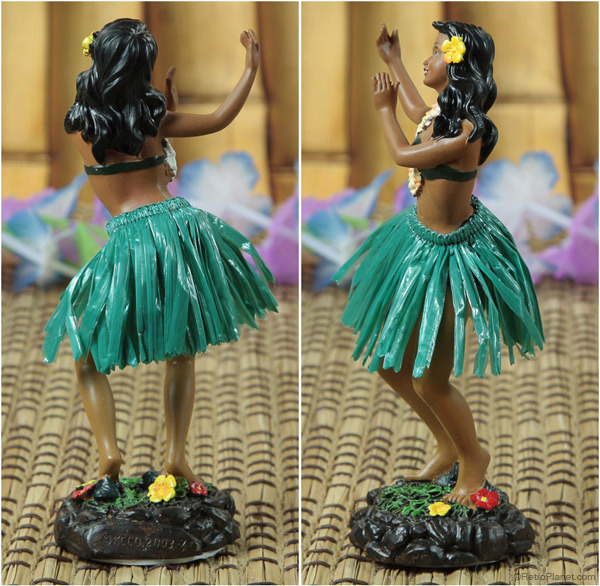 Our hula dolls are available in a variety of poses. 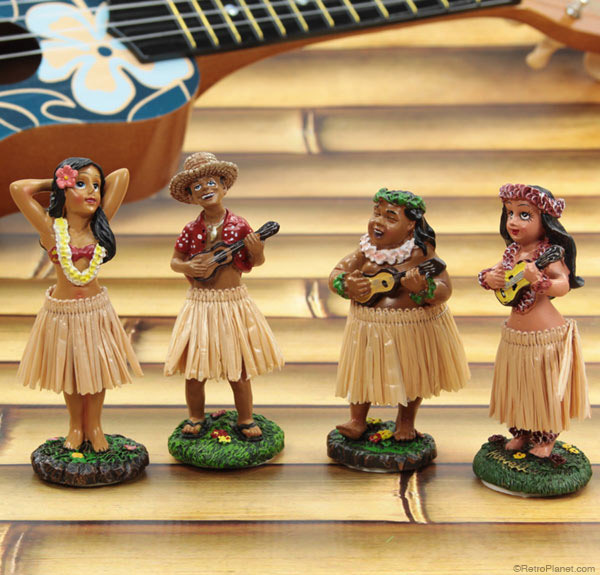 Some dance and sing, some dance and play a ukulele, but they all add Hawaiian style wherever you display them. Mini Hula Dashboard Dolls are diminutive and sweet. Measuring four inches tall, these will fit nearly anywhere you want to put them. And these can be purchased as a set! If you’re interested in the history of the Hula Girl Dashboard Doll, be sure to read our blog. And remember to send us photos showing the creative ways you’re displaying your hula dolls! 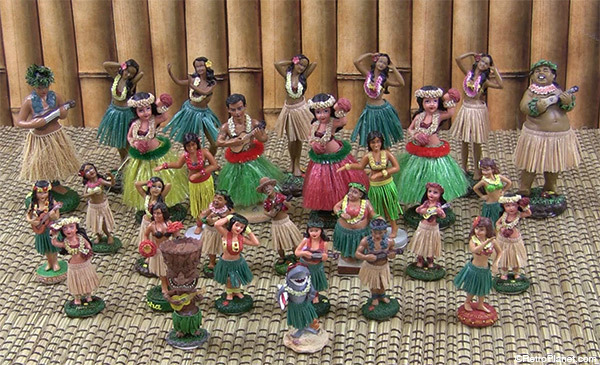 Our Hula Dolls come in assorted sizes and shapes. We have hula guys and gals, a shark and even a Tiki god hula doll.